It is hard to believe we have been back in New York for a month already. I have been so involved with catching up the family that the blog has gone dormant. I will catch us up over the next few days. We left you in Huntsville, Alabama a fantastic small city with a thriving downtown that is home to a number of coffee shops. 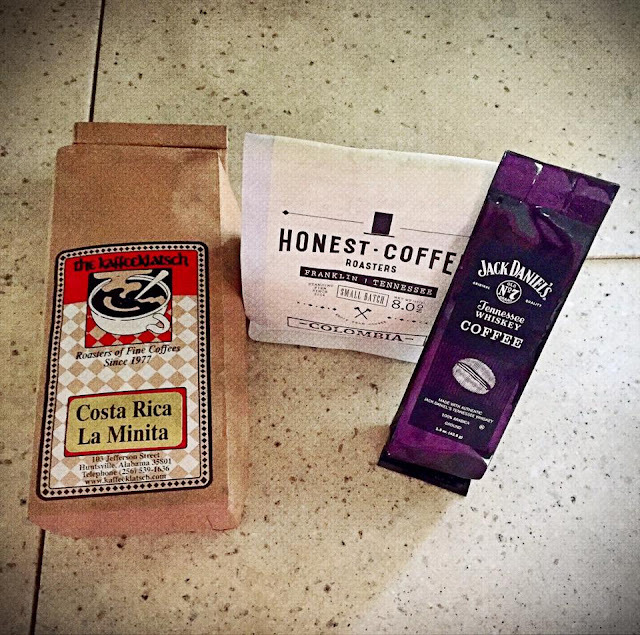 Our coffee collection grew in Huntsville. Honest Coffee Roaster was in a temporary location on Clinton Ave. It was not hard to find on the second level of U G White Mercantile. We enjoyed their ethically sourced Colombian blend as walked around the interesting mercantile shop that features made in Alabama products. Down the street and around the corner we found Kaffeeklatsh a shop that features coffees and teas and a professional tasting staff. I had consumed enough coffee for the day but Fred enjoyed a cup of the Costa Rican blend and liked it enough to bring a pound home. We enjoyed walking through the downtown area and up and down many of the cross streets of the Historic district. There is some great architecture represented with homes dating from the 1820's. There were ornate Victorian and Queen Anne structures and homes in the Greek Revival and Federal styles. We enjoyed the gardens and landscaping as we got our steps in for the day. 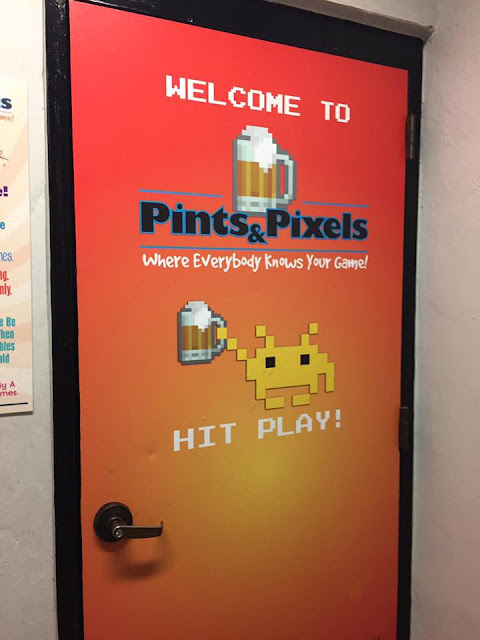 We enjoyed lunch at a great little bar that we passed signs for on Clinton Ave.
Pints and Pixels is located on the third floor of U G White Mercantile building. 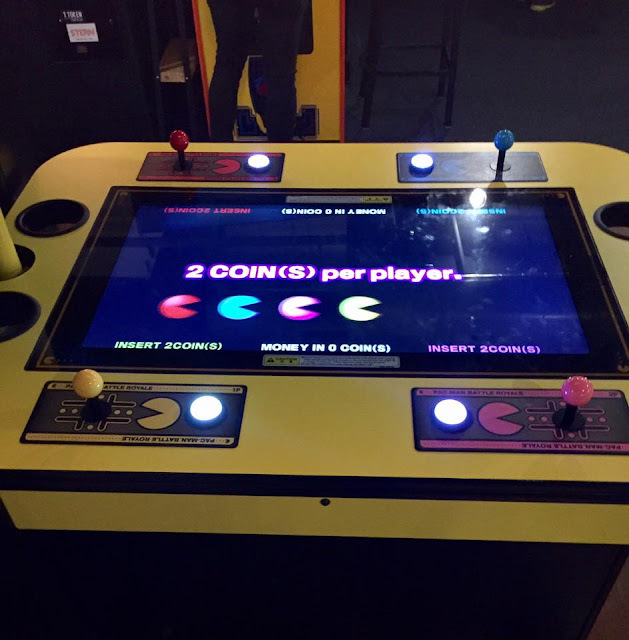 We climbed the stairs and passed through a steel door to enter a unique bar full of vintage pinball machines and video games. It was very nostalgic to listen to the bells and pings and we enjoyed our lunch while sitting at the bar. We earned tokens with by purchasing food and drinks. It was a great excuse for another round of craft beer. On our way out of town we passed the Huntsville Madison County Veterans Memorial Park. It is an impressive structure of walls and fountains that drew our eyes and compelled us to stop. The main component of the memorial is a horseshoe shaped wall that provides a timeline of all American Wars from 1775 to the present. The dates of the conflicts and the casualties associated with them are inscribed on black granite markers that sit in front of the wall. The names of Madison County residents who died during these conflicts are also inscribed on the black granite. The park contains several impressive statues and more are in the planning stages. Our reason for stopping in Huntsville and the highlight of our trip was to visit the US Space and Rocket Center home to Space Camp. The facility is adjacent to Redstone Arsenal where the Marshall Space Flight Center is located. We had been intrigued by this facility since the 1980's movie Space Camp and were glad to have a chance to visit. The Space and Rocket Center museum has an extensive Rocket Park. There are 27 rockets in this collection that astronaut John Glenn once called "the finest rocket collection in the world"
A separate outdoor exhibit called Shuttle Park features a fully stacked STS (Space Transportation System). Orbiter Pathfinder sits atop 2 solid rocket boosters and a genuine external tank with main engine nozzles. It is huge and impressive. In case you don't recognize the shuttle name, Pathfinder is a test simulator constructed by NASA in 1977. It is made of wood and steel and is approximately the same size as a working shuttle. It was used to figure out methods of moving and handling a shuttle without potentially damaging a working unit. Indoors the exhibits get even better. ISS: Science on Orbit is a life sized exhibit of what life in and on a the Space Station is like. We saw a sleeping berth with personal items strapped down around it. Imagine sleeping in an upright position and strapped into a sleeping bag so you don't float away! There were also replica racks of the Payload Operations Center where astronauts co-ordinate the care of science experiments. We spent a while speaking with docents at a mockup of the Huntsville Operations Support Center. The support center monitors the astronauts on ISS and guides them through caring for the experiments on board. One of the Special Exhibits currently on display is called Celestial Dreams. It is a Space Jewelry collection designed by artist Kathy Chan who is inspired by the cosmos that surround and include the earth. The exhibit the Huntsville facility is most proud of is its Saturn V Dynamic Test Vehicle. The Davidson Center for Space Exploration was built to house it. As you walk through the Davidson Center the rocket is suspended above you with its stages exposed. You can walk right underneath the immense vehicle and gaze into all of its various parts. The Davidson Center is like a timeline for the space program. We were amazed all over again looking at all of the exhibits and remembering the accomplishments of the the last 50 years. The fears of the US/Russian Space Race with duck and cover drills and backyard bomb shelters. President Kennedy's inspiring speech of the early 1960's that set a goal of manned lunar landing by the end of the decade. The Mercury, Gemini and Apollo programs. Celebrated astronauts are honored and lost lives are remembered. Our visit was everything we hoped it would be.